I want to know how to divide a PDF file into multiple files with unique keywords? I have a large PDF that has been combined from multiple documents. How can I split the PDF back into multiple documents with a keyword delimiter? 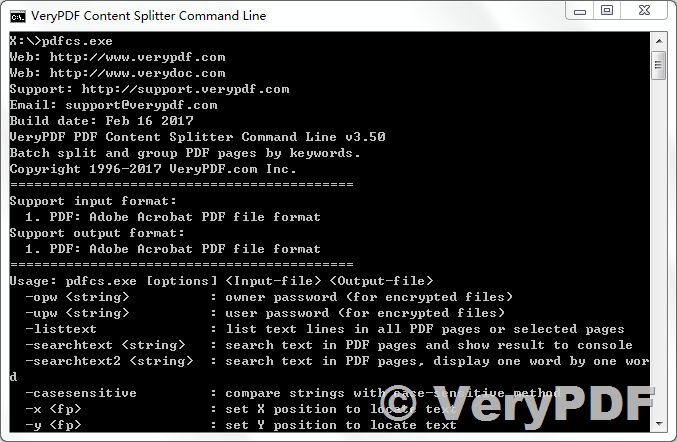 PDF Content Split is a a powerful software to split PDF to pages based on content! A standalone program requires no Adobe Acrobat. Split batch of PDF at the same time with ease. User-friendly interface and simple operation. Accurately recognize and identify content within PDF file. Packed with varied practical and impressive features. 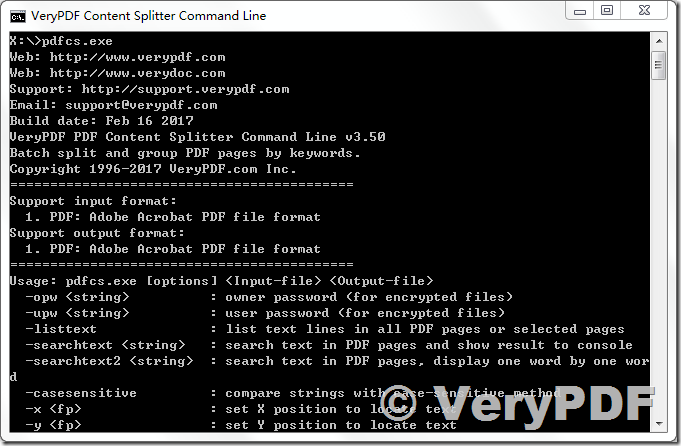 VeryPDF Content Splitter Command Line is a utility that lets you split Acrobat PDF files into multiple smaller pdf files based on location and text information within the files. It can be used to split composite PDF documents (such as invoices, reports or payroll) into separate files by keywords such as invoice number, account number or employee name. pdfcs.exe -$ XXXXXXXXXXXXX -mode 0 -x 422 -y 139 test.pdf "_out.pdf"
pdfcs.exe -$ XXXXXXXXXXXXX -mode 1 -x 422 -y 139 test.pdf "_out.pdf"
pdfcs.exe -$ XXXXXXXXXXXXX -mode 2 -x 422 -y 139 test.pdf "_out.pdf"
PDF Content Splitter Command Line is a standalone program, it does NOT require Adobe Acrobat Pro, which costs hundreds of dollars. Batch split and group PDF pages by keywords. for %F in (D:\temp\*.pdf) do pdfcs.exe -x 227 -y 34 -mode 0 "%F" "out_%~nF.pdf"
for %F in (D:\temp\*.pdf) do pdfcs.exe -x 227 -y 34 -mode 1 "C:\test\%~nF.pdf"
for %F in (D:\temp\*.pdf) do pdfcs.exe -x 227 -y 34 -mode 2 "%F" "C:\test\%~nF.pdf"
How to split PDF content on Mac system? How to get needed pages from different PDF to one PDF? This entry was posted in PDF Split-Merge and tagged pdf content split, split pdf content. Bookmark the permalink.